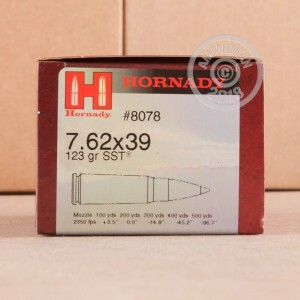 Turn your SKS or AK into a proper deer rifle with this high-end hunting ammunition from Hornady. 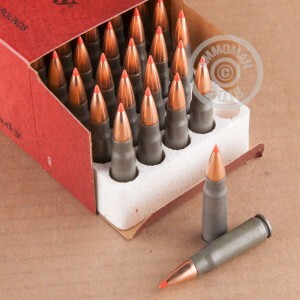 These cartridges fire a 123 grain version of the advanced polymer-tipped SST bullet at a muzzle velocity of 2,350 feet per second, producing typical 7.62x39mm ballistics. However, upon contact with the animal, these rounds quickly distinguish themselves from mil-spec ammo by producing massive expansion and a nice clean kill. This ammunition is loaded in Grand Island, Nebraska using non-corrosive Berdan primers and steel cases. 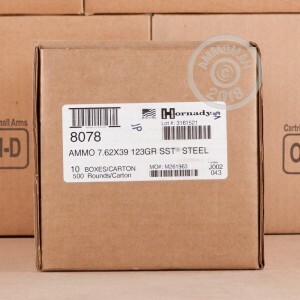 Grab a few of these 50 round boxes and enjoy free shipping from AmmoMan.com--or mix and match calibers as your needs dictate. Any order over $99 qualifies for free S&H.